War Hotels is a new documentary series airing on Al Jazeera and exploring stories behind iconic hotels that were used during war. 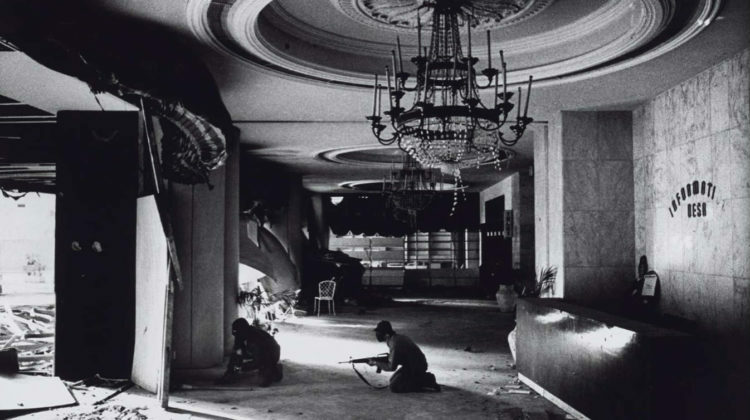 The Holiday Inn Beirut has long become a symbol of the Lebanese Civil War and its shell-scarred walls till today are reminiscent of this ugly era. The hotel was described once by British artist Tom Young as “a giant tomb which remains in the centre of the city like an unresolved scar”. The Holiday Inn was designed Andre Wogenscky, a student of French modernist architect Le Corbusier, along with the Lebanese Maurice Hindie. It opened to the public just months before the civil war began in 1975. You can watch the documentary [here].